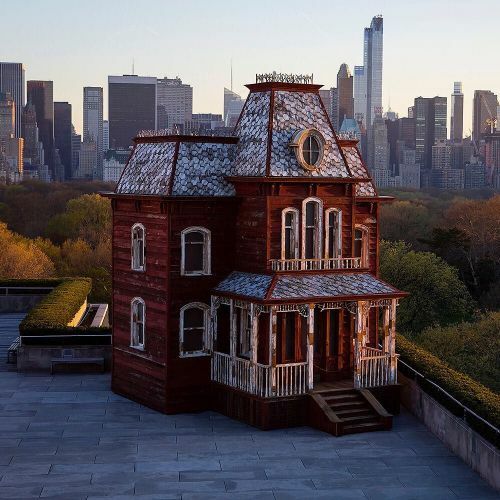 "You're not imagining things: There's a haunted house on top of the @metmuseum. And not just any haunted house. The old mansard-roofed Victorian mansion is a scaled-down version of the 2-sided set that served as the Bates family home in Alfred Hitchcock's 1960 thriller, "Psycho." "Transitional Object (PsychoBarn)" is the creation of Cornelia Parker, a British sculptor best known for squashing and exploding things. @caitochs took this photo of #CorneliaParker's piece, which opens on #TheMetRoof today and will be on view through October 31." By nytimes on Instagram.